Our earliest start yet, although there wasn’t much to do in the way of packing up before the long drive to Coober Pedy. Cloudy, breezy but not raining – yet! 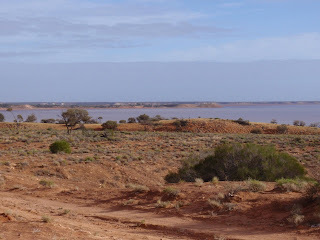 Similar countryside to yesterday with red dirt, salt bush and scrubby trees for some way, then the scrubby trees disappeared. We even ended up driving through stony desert, with very little or no vegetation at all. We have been lucky in that the salt lakes currently have water in them, something that doesn’t happen very often, evidently. Today we passed two large lakes, one in particular was very close to the road with a rest area beside it. Despite warning signs, we haven’t seen a lot of wild or animal life. Today it was one live and one dead cow, a few sheep and a dead kangaroo. However, the highlight was sighting FIVE wedge tail eagles – two flying, two perched in a roadside tree close to the road and the other was actually sitting on the dead kangaroo at the edge of the bitumen on the left hand side of the road. It was obviously more worried about the crows taking its lunch than us driving close by – just looked at us and didn’t move at all. Absolutely fantastic to get so close to these birds in the wild. About 35 kms south of Coober Pedy we started to notice opal diggings, which gradually increased in number the closer we got to the town. Coober Pedy appears to be an interesting place, although we haven’t actually looked about yet. The caravan park is quite small and very crowded – we are lucky I booked ahead and have one of the larger sites along the back fence. Gravel site, of course. There is no water available to the site, however, drinking water can be collected from a central point. If we want to fill our tanks (fortunately ours are full! ), water can be purchased from the Council – 30 litres for 20 cents, which isn’t too bad. Washing machine is $5 per load and a shower is 20 cents for 2 minutes. Thank goodness we have our own shower. We haven’t had any rain, yet, today, but it is very windy. The temperature seemed to hover around 13-14 degrees most of the day, with a peak to 19 for a brief period during the afternoon. We will be here for three nights. love the new photo of the two of you.